I really like the bold print on the Big Buddha sandals but I feel as though it might be a bit much for every-day wear. Plus, I'm not familiar with the brand so I don't know how comfortable/supportive they are. 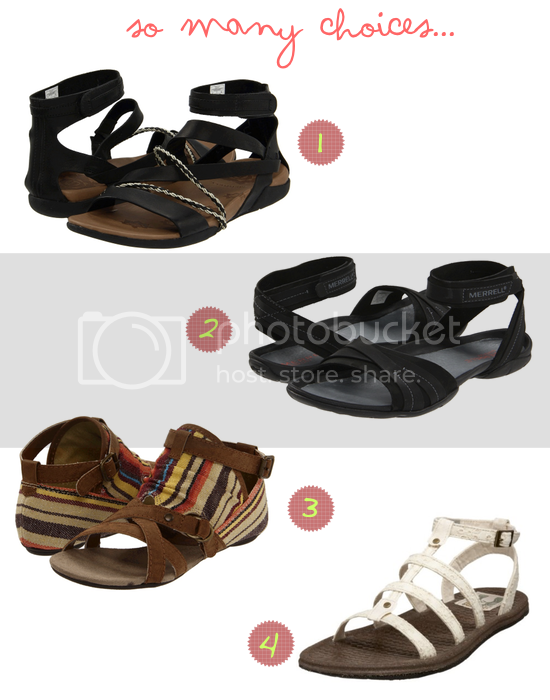 My favorites from the bunch are the Merrell sandals. My only hesitations are that - 1. I can't decide between the two, and 2. they're much more expensive. I do realize that although it's a lot of money up front, Merrell shoes are ultimately worth it, and I'd be wearing them for years to come. I also feel like I'd be able to wear either pair pretty much constantly, without worrying about discomfort. Which ones do you like? Would you drop some money on Merrell sandals?